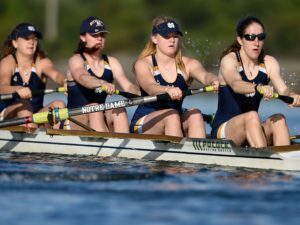 For the eighth week in a row, Princeton University claimed the top spot in the USRowing/Collegiate Rowing Coaches Association NCAA Division I Varsity Eight Coaches Poll, while Western Washington University and Williams College topped the Division II and III polls, respectively. Princeton was the unanimous choice in Division I, earning all 24 first-place votes to remain atop the rankings. California, the defending NCAA champions, ranked second, followed by Southern California, Ohio State, and Brown University. Western Washington earned four first-place votes to remain atop the Division II poll. Barry University ranked second with one first-place vote. Dowling College ranked third. For the third consecutive week, Williams College topped the Division III poll. Williams received eight of nine first-place votes. Trinity College ranked second, followed by Ithaca College, which received the remaining first-place vote. Tufts University and Smith College rounded out the top five. Not Ranked But Receiving Votes: University of Tennessee 31, Duke University 9, Oregon State University 8, University of Louisville 8, Columbia University 7, and Northeastern University 2. Not Ranked But Receiving Votes: University of California at San Diego 1. Not Ranked But Receiving Votes: Connecticut College 24, Wellesley College 14, Marietta College 13, Pacific Lutheran University 6, and Simmons College 6.